I grew up drawing pictures - filling notepads, the backsides of used typing paper, and even the white cardboard inserts from pantyhose that my grandma saved for me - of my world. God bless her, my mother has boxes and scrapbooks of these efforts to sketch Donald Duck or Garfield the Cat. I come from a family that communicates visually; each of my siblings artists in their own right. 12-hour car rides often consisted of my brother and me making a shared doodle, trading back and forth to add one element to the picture at a time...me always trying to stump him and never succeeding. I began college as a studio art major, and my favorite classes were drawing and figure drawing. Charcoal and conte crayon were my companions on easels and sketchpads. I identified with the title "artist," and I had gallery showings to prove this point. So why would a whimsical series like the 30 Day Sketchbook Challenge throw me for a loop? Nicki and Kim were great enthusiasts and artists so it sounded like a great way to stretch a bit and warm up the old muscles again. I pulled out my bestest pens, my favorite kind of paper, and I sat in my most inspiring spot. I began to draw. I started sketching objects around me. Hmm, is that worth a drawing? Oh, wait, the line looks bad. I think that shape is way off, and the proportions look goofy. This does not look good. Seriously, I should redo this one. Starting over. Urgh. This one is worse than the last one. It was loud, I tell you. That inner critic of mine came racing out to greet me at every sketch. I didn't even notice it at first (we do, in fact, live together all the time so it's not that surprising), but as I began to take "too long" to finish I realized that I was becoming more and more self conscious of my work. And I didn't want to finish. And I didn't want to photograph it. And I didn't want other people to see my work. That gal who used to identify (with even a hint of arrogance) as an artist now felt embarrassed to show simple sketches. So what's a gal to do? Well, nothing. I mean that's what I had planned - nothing. Inevitably, my children had other thoughts. Lovingly nosey as they are, they wanted to know what I've been up to. "Will you draw with me?" "This is so much fun. Ooh, Mommy, are these your drawings? Oh, I love that one. Oh, and this one, too. You're so good, Mommy." I won't deny their enthusiasm and affirmation felt good to my wobbly ego. But it wasn't as much their input that made me move from my nothingness. It was my need to be more for them. I couldn't expect them to push past their mistakes or less-than-loved creations if I couldn't. What kind of mom is fearful of her own imperfections? Well, this one, but I decided to push through it. With my big girl pants on, I took my photos and posted. Some enthusiasm and affirmations came from kind and generous people on the internet. I took a deep inhale at every SEND to Instgram. And somewhere around Day 4 or 5, I caught a glimpse of one of my sketches on screen. In the first millisecond I didn't recognize it as mine, and I really liked it. Sinking in that I had in fact drawn the piece, I looked carefully at the details. And then I went through and looked at other sketches. I began to see my style, my technique coming out. I remembered it from ages ago, and yet it was something new, too, and fresh. And I've discovered "it" in other artist's work as I follow along with these drawings. One day you'll see a breakthrough - a new subject or letter creation that really seems to hum uniquely from that individual - all from committing and sticking with the journey. I've asked that noisy critic to take a seat up in the balcony where I can't hear her as well while I move on and create a whole bunch of what needs to be made. And I'm pushing on through because I know something new and even better awaits. Welcome to Wednesday, friends! We, Americans, have a dynamic holiday coming up tomorrow, and my family is looking forward to heaping helpings of berry trifle, hotdogs/hamburgers, and bowls of watermelon. But before we bust out into full-out holiday fun, I have some great projects for you! First up, a drawing challenge for anyone who's game. Nicki Traikos of Life I Design put out the offer to join her in the #30daysketchbookchallenge. That's right, every day for the next 30 days, the task is to sketch, photograph, and post with that hashtag. Simple, right? At first I was all about cheerleading for these brave ladies like Kim of Design Life Kids. What guts do these women possess to share their doodles with the world, heh? And then it was me sitting with a legal pad and a great ink pen, scribbling away, and snapping a few shots. I am such a sucker for a good challenge. So, here I am, putting my brave on (no judging please), and I'll be sharing my sketches along with a growing community of others. We are only on day 3 so there's still plenty of time to come along! The two shots above are my #1 and #2 sketches. I'm working on my prizes for AltNYC friends which will incorporate some of the best quotes from the conference along with some handlettering to make a great piece of New York that we can all keep alive!! Following the brilliant lead of Elizabeth from the Note Passer, I've begun a Sketching Thoughts Pinterest board that you're welcome to follow for some drafting ideas. 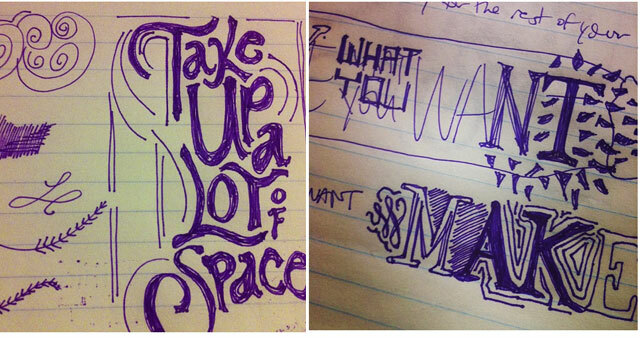 What you see here below is what I'm calling: Persuasive Doodling. Yes, I just made it up. 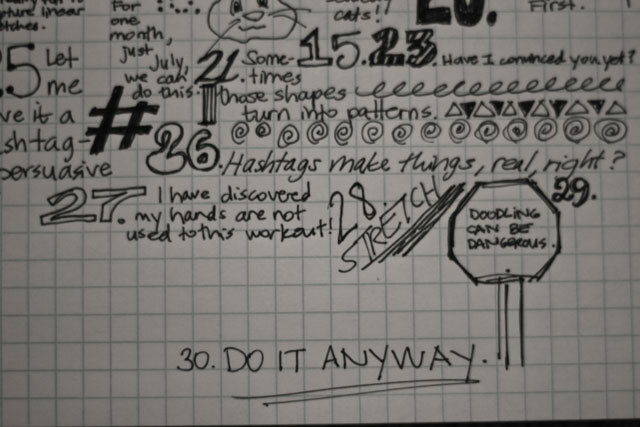 Here is my 30-reason manifesto as to why you should join the 30 Day Sketchbook Challenge. Sorry for the lack of order. This is how my brain works. 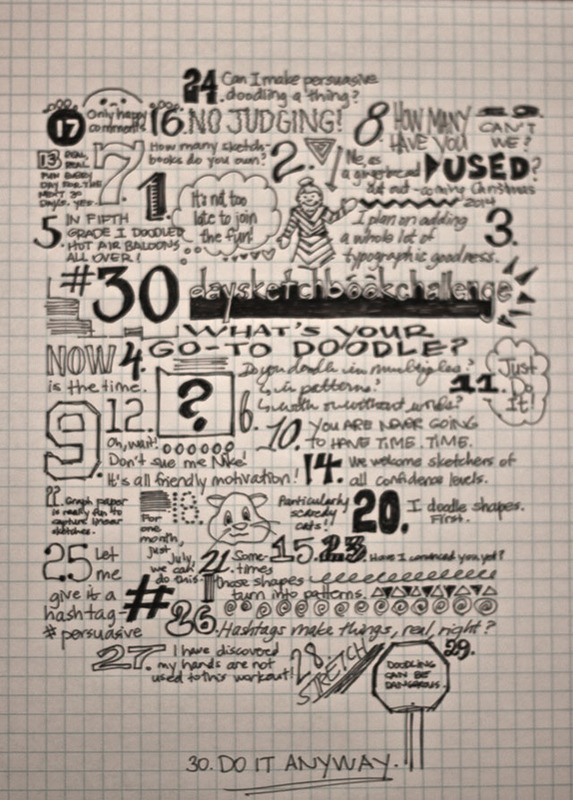 Incorporating such nagging questions as - What is your go-to doodle? You know, the one you find yourself making when you're terribly bored in a meeting or stuck in a waiting room. And great reassurances like, "Hashtags make things real, right?" 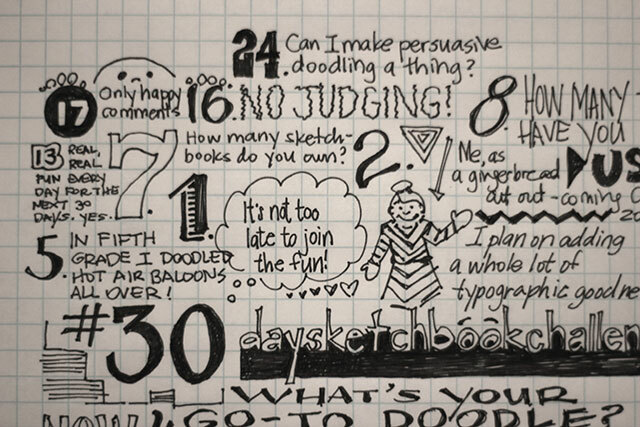 Check out #30daysketchbookchallenge to see all the sketches coming at you daily. 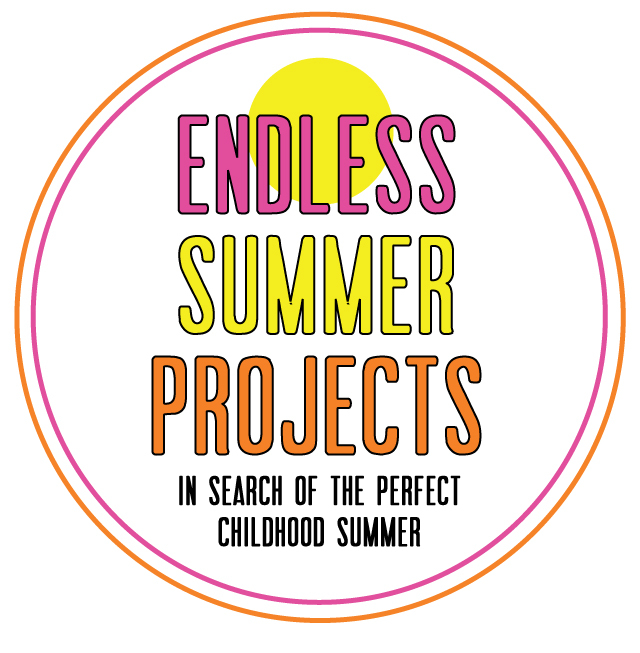 And for the children in your life, the bubbly Alexandra has this week's Endless Summer Project with Bubble Painting! Bubbles are still great fun for all three of my kiddos, even at 8, 6, and 3. Swapping turns from bubble makers to bubble poppers, and chasing wherever the wind might blow. And now Alexandra has a way for kids to create that pop of color with some fun outdoor art. This would make a fabulous addition to your family fun for the 4th.